SOFTLY SPOKEN, FIERCELY COMPETITIVE, and with God on his side, Senna was a hell of a race car driver. This documentary is extremely well crafted. 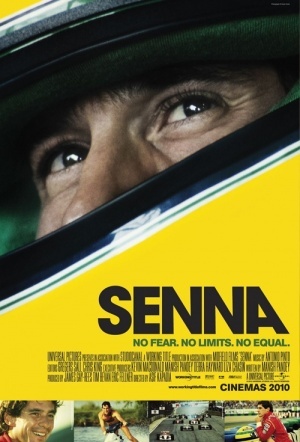 Very cinematic in its choices, the only talking head we ever see is Senna's, the rest of the time it's vintage footage. Which gives the film its immediacy. The poignancy that pervades the film is because you know how it ends - this is, indeed, a tragedy. But a quite beautiful one - about a quietly intense and effortlessly charismatic man who became a potent symbol of joy in his home country of Brazil. Interestingly, he describes his purest driving as being his time karting, as a teenager. Which reminded me of local film THE HOPES & DREAMS OF GAZZA SNELL. Senna has far greater scale ultimately, but the pure joy of driving that grass-roots karting evokes is clear in both films. Recommended.